. Don't forget to follow us on Twitter while you're there! It's fitting that our newest birthday present was announced first on Twitter. 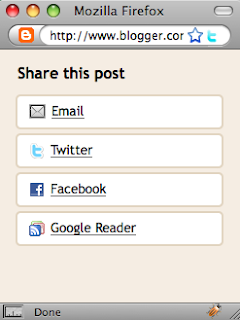 Starting yesterday, the Blogger Navbar includes a new button: "Share." When your readers are on your blog's home page, they can click "Share" to post the blog's URL to Twitter, Facebook, or Google Reader. If they navigate directly to an individual blog post, clicking "Share" in the navbar also lets them share the post by email. We've already seen some nice adoption of this new feature and hope this helps you build out your audience and share your story with the world. Here's a fun hack: each URL that gets shared has a specific parameter appended (?spref=nn, where fb=Facebook, tw=Twitter, and gr=Google Reader). If you're using Google Analytics to measure traffic on your blog, you can search for those strings to see how much traffic you're getting from each source. On the other hand, if you're interested in seeing which blogs people are sharing, head on over to Twitter search and you can watch as people share blogs and posts that they like. Don't forget to follow us on Twitter while you're there! on the receiving end of a DMCA complaint. Much commentary at the time focused on claims that we were removing blog posts at the behest of music labels, that we were not notifying users, and that we weren't providing users with any recourse if they were linking to the music with permission. Though we noted at the time that we hadn't changed anything and were still following our documented policy, we realized that there was room for improvement. Over the next several months, we talked with the Electronic Frontier Foundation and ChillingEffects.org, and reached out to a number of users to find out what they'd like to see in our policy moving forward. We're happy to make those changes our latest birthday present for our users. First, a quick review: the DMCA is a U.S. law that says that a copyright holder (a music label, for example) can notify services like Blogger if they see cases where their content is being used without permission. Once we're notified by the music label and we believe the claim to be valid, we are then obligated to remove the content—otherwise we could be found liable for its continued use. Up until today, when we received a DMCA complaint, we would send an e-mail to the owner of the blog, forward a copy of the complaint (usually a fax) to ChillingEffects.org (more about Chilling Effects here), and delete the post. There were several problems: first, some of our bloggers hadn't updated their e-mail addresses in years (Blogger's been around a while!). Second, ChillingEffects.org needed to review the faxes we sent to ensure that they weren't inadvertently publishing personal info, sometimes causing lengthy delays in the publication of the complaint. This meant that the blogger couldn't see the substance of the complaint—often for months. Finally, the post was gone! Posts that contained dozens, even hundreds, of links were removed from the Internet because of one link, and often the blogger didn't know the link wasn't acceptable. DMCA Complaints are handled via a web form. This form makes data intake easier, and makes it possible for us to share information with ChillingEffects.org without passing along personally identifiable information. It also allows us to notify affected bloggers more efficiently, as we provide information on not only the blog post in question but also the actual link(s) at issue. Complaints are sent to ChillingEffects.org automatically. ChillingEffects.org will have a copy of the complaint soon after Blogger receives it, making it possible for the blogger to find the complaint by searching for their blog's URL at ChillingEffects.org. Blogger notifies affected users through their dashboard as well as by e-mail. While we hope all of our users keep their e-mail addresses current so we can notify them in case there's anything important (hint, hint), we also went further by putting a big status message at the top of their dashboard to let them know about the DMCA complaint. Blog posts are reset to draft status and are not deleted. Now that users have the info they need to know specifically what the complaint was about, they can edit their post (found in their blog's dashboard status message, as well as by searching for posts in "draft" status) to remove the offending content and republish the post. We realize this birthday present isn't for everyone—we'd hope most of you never receive a complaint. But music bloggers are a large segment of our users—and we know that for those who've received one or more DMCA complaints in the past, this may have been a frustrating experience. Please take care to remove the offending content once notified of the complaint—once you do, you can republish the original post so your audience will continue to have access to the other content contained in the post. This was a cross-team collaboration between our legal, policy and engineering groups, and on behalf of everyone who helped make this change possible: happy birthday! Earlier this year, a number of our users complained about their experience on the receiving end of a DMCA complaint. Much commentary at the time focused on claims that we were removing blog posts at the behest of music labels, that we were not notifying users, and that we weren't providing users with any recourse if they were linking to the music with permission. Though we noted at the time that we hadn't changed anything and were still following our documented policy, we realized that there was room for improvement. Over the next several months, we talked with the Electronic Frontier Foundation and ChillingEffects.org, and reached out to a number of users to find out what they'd like to see in our policy moving forward. We're happy to make those changes our latest birthday present for our users. 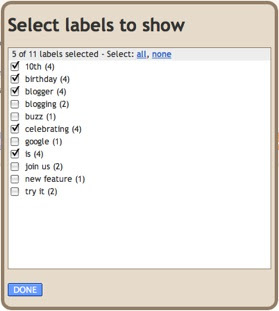 that we wanted to hear from you about your wish list for features in Blogger. Many of you said that the label gadget should be more flexible. Today we are rolling out two enhancements to the label gadget. In April, we announced that we wanted to hear from you about your wish list for features in Blogger. Many of you said that the label gadget should be more flexible. Today we are rolling out two enhancements to the label gadget. later this year. That day is almost upon us — just six days away in fact — and we've been hard at work trying to think about what we could give you to celebrate. Wait, what? What we could give you? That's right. This is our birthday — but we're celebrating your contributions over the years. Over the past decade, millions of people around the world have made Blogger what it is today: a vibrant community of real people telling their stories. When we asked you to tell us your Blogger story, you responded: you connected with far away family, shared your art, grew up, demonstrated your expertise in an emerging area of research, overcome childhood adversity, met authors and poets you admire, coped with an illness, became a parent, learned a new culture, struggled with your parents' divorce, placed digital messages in virtual bottles, helped people fix their cell phones, wrote a novel. You even made the inaugural blogging team at school, and while there you're working on your PhD on consumer trends towards blogs. There are millions of such stories — and they grow by the day. As we turn ten, we wanted to give you some presents to commemorate this milestone and thank you for letting us be part of your story. 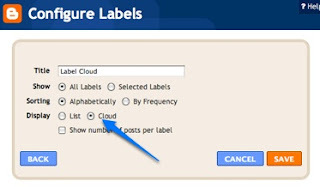 Over the next several weeks we will be releasing a number of new features on Blogger. Some presents are because you asked for them this spring. Other presents are because they meant a lot to us. And some are because our friends (both inside and outside of Google) wanted to chip in and give you something. In short, it's a lot like a real birthday: you won't necessarily want or need every present that you get, but keep in mind: it's the thought that counts! We're excited to share this milestone with you. Stay tuned, the next several weeks will be a lot of fun! A few months ago we mentioned that Blogger was turning 10 years old later this year. That day is almost upon us — just six days away in fact — and we've been hard at work trying to think about what we could give you to celebrate. as possible, sometimes it can take a while for the bits to travel through the intertubes. We're happy to announce that Blogger has rolled out support for the PubSubHubbub protocol, which turns feeds into real-time streams. What does this mean to you? As feed readers adopt PubSubHubbub, your posts will surface immediately for their users. For example, Google Reader has started rolling out support for PubSubHubbub; when it's complete, your Blogger posts will surface in Google Reader as soon as you publish them. FriendFeed, Livedoor Reader (a feed reader popular in Japan), and FavIt already support PubSubHubbub—which means that their readers are already benefiting from this new feature. Best of all, your blog is already broadcasting updates—you don't need to do anything to enable it. Some more details: All blog post feeds now contain a "hub" element, and will ping Google's hub on every post update. If you're a developer writing code to monitor feeds and want to get updates efficiently in near real-time, you just need to detect the hub link and subscribe to the hub server. Then, sit back and let the hub push updates to you. To learn more about PubSubHubbub and start adding code to your project, see the PubSubHubbub site. Thanks to Brad Fitzpatrick and Brett Slatkin who worked on a 20% project with the Blogger team to add this support over the past few weeks. We encourage any developer who wants to get a near real-time flow of updates from Blogger to use PubSubHubbub for their application—it's simple, efficient, and lightning fast. If you have questions, you can find answers in our developer support forum, or you can reach us on Twitter: @blogger. When you publish a public blog post, you want to share it with the world—immediately! Blogger helps by feeding your posts to subscribers all over the web. Unfortunately, while we really want things to be as speedy as possible, sometimes it can take a while for the bits to travel through the intertubes. Head on over to the Twitterfeed site, click Sign In with OpenID and type in your Blogger blog's URL. Once you've registered you'll then be taken to the New Feed page where you can start linking blog feeds to your Twitter account. First click the Connect your feed to Twitter Account button, which will prompt you to enter your Twitter login credentials to authorize Twitterfeed's access. You will get a nice little confirmation once you've successfully linked up your Twitter Account. Next just enter a name for your feed, as well as your blog's Feed URL into the form. If you want to customize your feed's settings you can modify frequency, add prefixes, and even create keyword filters. Otherwise you're all set—click the Create Feed button and your Twitterfeed is enabled. You can always come back later to the Twitterfeed site and modify your feed settings, as well as look at click-through metrics for existing feeds.